Twenty reconditioned F.22's were sold to Egypt in 1950 and 10 to Syria. This white skin is a remake of previous Wrench's one. Decals are old ones. I made this only because I liked so much the original I can't wait to use the new model in DLC 29. All the credits to Kevin. Using my Home Grown Templates  for the stock 3rd Wire Spirfire 9c, this skin set adds the D-Day Invasion stripes set. This is a "blank" skin, with no marking other than the Invasion Stripes, and can be used with any of the available decal sets for the stock Mk.IXc AND Mk.IXe. A simple rename of the textures will allow it's usage on either one. See "Notes" for more details. The stripes represented here are the 'full' set, top/bottom of wings and fully wrapping around the fuselage, as used from June 6, 1944 to approx September 44 (ish). The Sky ID band has been omitted, although photographic evidence exists of it having been used, even with the Invasion stripes. Yellow wing IFF bands remain. REMINDER-- this is not a 'full' ready-to-use skin pak. The folder is just named "DDAY" for convience. You'll have to create specifically named skin folders (ie: 411-DDay, for example) for proper, historical usage. There is no decals or texture set inis included -- however, a "base" texture set showing the in-game labeling is included, but NOT usable per se. It's just there to show how to set the Displayed Name labeling. As the mapping for both the 9c and 9e is identical, as are their respective decal positions, any of the existing Spifire 9 decal sets can be reused with this skin. As always, fairly easy to follow, yet detailed install instructions are included. So, please =READ= them !!!. "C" Flight, No. 145 Squadron, aka "Polish Fighting Team"
All marking are decals, and decal randomization is TRUE for the 16 plane-in-squadron and serial number decals. Serial numbers marked with a star (*) are 100% historically matched to their plane-in-squadron number. Those marked with a cross (+, ok the plus sign! ), while having served with the PFT, could not be matched to a specific aircraft. Those without any markings, are 'generic'. It should be noted, that the PFT used numbers, instead of letter for their individual IDs. Please note, this is just the skin/decal set. I've not included any of the bits needed to make the aircraft Player Flyable . There's plenty of other mods that do this. in the upper right skin selection drop down. The aircraft carries 'standard' SEAC markings for the period. Code and "plane in group" letters (18) are correct for East Indies Fleet use, but I have not found any references if they carried the "D5" code with HUNTER in the Med. Most likely, they did. In that case, a different skin for MTO usage would be needed, and the national markings decals would need replacing. I have included the PSD I used to make the fuselage codes for any other skinners to use for that purpose, or for other FAA aircraft. All markings are decals and Decal Randomization is TRUE. but a drip tank is. (but is acting quite "oddly" for some reason). included. So, please read them. Also, give the "Notes" section a read too. 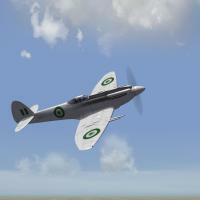 A new skin for the TMF/ModMafia Spitfire Mk.1A, representing 602 "City of Glasgow" Squadron around the time of the Battle of Britian (ish). REMINDER: this is for the TMF/MM Spit 1 ONLY!!! Like the original release of the TMF/MM Spit 1, it uses a pool of plane-in-group letters and serial numbers, so you MUST have to original release of the TMF/MM Spitfire Mk.1a to apply this pack to. The only thing different is the squadron code decal, LO. 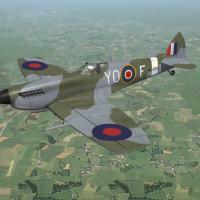 No.19 Squadron was the first RAF unit to be equipped with the Spitfire, which entered service in August 1938. The squadron was based at the time at Duxford in Cambridgeshire, now famous for its Warbirds. By September 1940, the squadron had been reissued with 8-gun MkIa aircraft after a month-long rather unsuccessful operational trial of the 20mm cannon-armed MkIb. Squadron Leader Brian 'Sandy' Lane led 19 Squadron during the later part of the Battle, flying P9386 'K', recognisable by its yellow ex-OTU spinner. Other noteworthy members include Flt Sgt George 'Grumpy' Unwin, one of the original members of the squadron at the time the Spitfire entered service (X4179 'H'); Sgt Bernard Jennings flying X4474 'I' and Flight Lt Walter 'Farmer' Lawson with X4170. Serial numbers in this pack correspond to aircraft used by 19 Squadron during September 1940, although many of these aircraft were on strength only for some days, for obvious reasons. Where possible, I have tried to ensure that the individual letter and serial number correspond to reality. A reskinning of the stock 3W Spit 9C to 411 "City of York" Squadron RCAF during WW2 in Western Europe. Included are modified data and loadout inis. See 'changes' in the Notes section for full listing. And, for you viewing pleasure, brand NEW Hangar and Loading screens. The assumption (oh! that word!!) 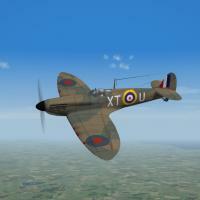 is being made that you've already made the aircraft player flyable, so no cockpit bits are included. Neither is my "One Click Restore Main Ini" (patent pending). A reskinning of the stock 3W Spit 9e to 401 "City of Westmount" Squadron, RCAF during WW2 in Western Europe. Included are modified data and loadout inis. See 'changes' in the Notes section for full listing. And, for you viewing pleasure, a brand NEW SF2-style Hangar screen. The assumption (oh! that word!!) is being made that you've already made the aircraft player flyable, so no cockpit bits are included. Neither is my "One Click Restore Main Ini" (patent pending). 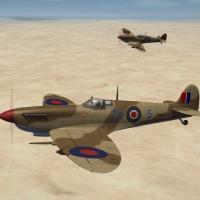 These 2 Mk.IX skin sets should give the recently (re)relased FWs something to contend with! 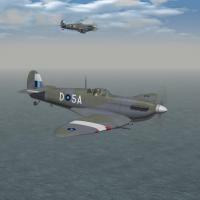 A new skin for the TMF/ModMafia Spitfire Mk.1A, representing 603 "City of Edinburgh" Squadron around the time of the Battle of Britain. Like the original release of the TMF/MM Spit 1, it uses a pool of plane-in-group letters and serial numbers, so you MUST have to original release of the TMF/MM Spitfire Mk.1a to apply this pack to. The only thing different is the squadron code decal, XT. The skin is in jpg format, Decal Randomization is TRUE. A reskinning of the stock 3W Spit 9c to 341 Squadron, FFAF (aka: GC III/4 Alsace) during WW2 in Western Europe. Skins remain in their 'lorez' 512 size, and are still in bmp format. Decal randomization is set to TRUE. All marking on the aircraft are decals. This will make it exceptionally easy for skinners to create other RAF squadrons of this time period. For those with historical tendencies, this is the squadron that Pierre Clostermann served with. This will work only if you have installed DLC No. 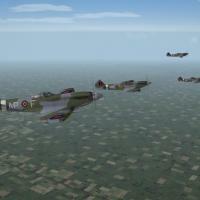 29 AI Aircraft Pack 2, including the Spitfire F.22. Without this pack installed, you will not have the necessary model files. The SRAF received 22 Mark 22 Spitfires from Britain in 1951, and these were used to form two fighter squadrons until 1954 when they began to be replaced with Vampires. The final Spitfire was withdrawn in 1956; most aircraft were sold on to Syria, although SR64 and SR65 remained in Rhodesia. SR64 was subsequently rebuilt and restored to airworthiness but crashed in 1982, killing its pilot. This uses an essentially unmodified data.ini and loadout.ini as supplied in the initial DLC pack.Nationality entries have been changed to read 'Rhodesia' but are otherwise unchanged. Serials include 20 of the known serials for the two batches of Spitfires. There is some disagreement about the actual colour of these aircraft; some say High-Speed Silver, others pale grey-blue. I believe both are probably correct, as the aircraft will have been delivered in RAF Silver and may subsequently have been painted pale blue. The cockpit is by Kesselbrut and used with gratitude in accordance with the CA fair use agreement. I have no idea where the pilot came from, but thank you anyway! Skin modification, serials, sounds, screens, decals and decal placement by ndicki. The unarmed MkXI photographic reconnaissance Spitfire came into service in early 1943, and was basically a modified MkIX airframe with a MkVIII retractable tailwheel and fittings for three cameras. Further modifications included leading edge fuel tanks and a larger oil tank in an enlarged chin fitted below the Rolls-Royce Merlin 61, 63, 63A or 70 engine. Early aircraft kept the original rounded rudder, while the second production batch had the later pointed type. The serial numbers included in this pack correspond to early production MkXI aircraft with the rounded rudder, all built during late 1942 or early 1943. As such, they can be used for missions dating from February 1943 until the end of the War. 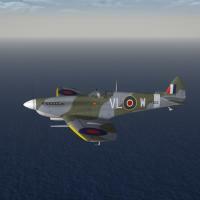 As PR Spitfires did not carry squadron codes, any PRU/PR Squadron may be represented. Aircraft were delivered in the standard RAF Day Fighter Scheme of Ocean Grey, Dark Green and Medium Sea Grey. The Ocean Grey uppersurfaces were quickly repainted using household paint to a more effective brownish sand colour. When the Free Czech squadrons of the RAF (Nos. 310, 312, 313) returned to Czechoslovakia after the end of the War, they took their aircraft with them, specially repainted in Czech colours before their departure from RAF Manston. These aircraft were supplemented by a number of others bought from Britain, but with the arrival of the Communists in power in 1947, the S-89 as the Spitfire was known locally fell out of favour and was phased out in favour of Soviet types. Many Czech Spitfires were sold on to the new State of Israel. This is my rather limited way to saying thank you to Monty CZ for all the fabulous aircraft he makes for us! Malta stands in a key position in the middle of the Mediterranean, between Sicily and Libya, right on the main supply route for Axis forces in North Africa. For this reason, it came under constant attack from mid-1940 until late 1942 when the Allies took the initiative in North Africa. This is the longest siege in both British and Maltese history, and on 15th April 1942 King George VI awarded the island with the George Cross as a token of respect for its dogged and determined resistance. Initially, Malta was defended only by a handful of worn out Hurricanes which nonetheless gave a good account of themselves, but they were clearly not a match for the latest Bf109F fighters deployed by the Luftwaffe. 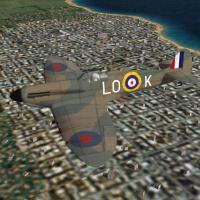 The choice was simple - supply the island with Spitfires, or lose it. The difficult part of the operation involved actually getting the Spitfires to Malta in the first place. Shipping was being lost at an alarming rate, yet with the limited range of the Spitfire, flying them from Gibraltar was impossible. Finally, an underbelly slipper tank was designed, and a plan began to come together. The aircraft would be carried aboard HMS Eagle to a point off the Algerian coast from which they would be able to reach Malta with their last drops of fuel. On the second attempt on 7th March 1942, however, all aircraft bar one with fuel feed trouble took off successfully under the command of S/L Stan Grant, and flew the 660 mile journey to Malta without mishap. The way was open and Malta would survive. By the time the next delivery of a further 9 Spitfires took place two weeks later, only two of this initial batch were still airworthy. Serial numbers in this pack correspond to the aircraft used in Operation Spotter. All 16 were newly-built MkVb(T) aircraft, which explains their consecutive serial numbers. They were delivered in the typical Desert scheme of Midstone, Dark Earth and Azure Blue, and at the time of their epic flight, they did not yet carry individual letters. I have assigned these letters on a purely hypothetical basis as I have not been able to determine if they were in fact carried during service with 249 Sqn or not. Originally No.1 Sqn RCAF, the squadron became operational on Hurricane at Northolt in August 1940 after a period of in-theatre training. After the Battle of Britain, in which it was reasonably successful, it was moved to Prestwick in Scotland. Shortly after returning to the South to Digby in February 1941, it was renumbered to No.401 to avoid confusion with No.1 Sqn RAF. 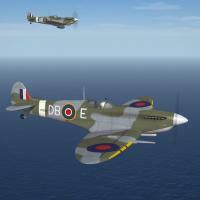 Spitfire MkIIs replaced the Hurricanes in September 1941, and were themselves replaced by MkVbs before the end of 1941. These aircraft remained until their replacement, in turn, with the new MkIX in the course of the late summer of 1942, making 401 one of the first squadrons to operate the MkIX. In October 1941, 401 had moved from Digby to Biggin Hill, carrying out offensive sweeps over Northern France. Serial numbers in this pack correspond to MkVb aircraft used by 401 Squadron during 1942, although many of these aircraft were on strength only for some days, for obvious reasons. Where a pilot has been identified as having flown a particular aircraft (The Royal Air Force did not attribute aircraft to particular pilots, although many did tend to have their favourites) that pilot has been listed in the menu. Aircraft of note are Pilot Officer Don Blakeslee's BL753 'H' and Pilot Officer Don Morrison's BM373 'F'. Aircraft appearing in the menu without an asterisk carry the correct individual letter for that aircraft. This Ocean Grey/Dark Green/Medium Sea Grey Day Fighter Scheme was introduced wef August 1941, although its implementation lasted up until at least the end of 1941. This original shade of Ocean grey, not to be confused with the shade standardised in mid-1942, was ordered to be mixed from seven parts Medium Sea Grey to one part Night and applied on-squadron. In practice, while it could vary wildly, it was generally darker than the later, factory-produced shade, and lacked the blueish hue. It is typical of the period running from late 1941 until the autumn or even winter of 1942. After fighting throughout the Battle of Britain, during which it produced a number of noteworthy aces, No.92 stayed at Biggin Hill during the summer of 1941. This was the time when the RAF began its 'lean forward' into occupied France, effectively turning the tables on the Luftwaffe and finally taking the fight back to the Continent. 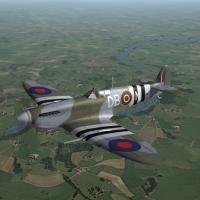 In February 1941, No.92 was the first squadron to receive the new MkV Spitfire. The markings carried throughout 1941 included the Sky 'Fighter Command' band and spinner introduced in December 1940 and returned to the all-Sky undersides again after a brief period from December to April when the port wings of fighter aircraft were once again painted black. At this time, the spinner and band were in fact generally painted not Sky but Sky Blue for some reason; the correct Sky colour appeared more generally in the second half of 1941. Serial numbers in this pack correspond to MkVb aircraft used by 92 Squadron during 1941, although many of these aircraft were on strength only for some days, for obvious reasons. Where a pilot has been identified as having flown a particular aircraft (The Royal Air Force did not attribute aircraft to particular pilots, although many did tend to have their favourites) that pilot has been listed in the menu. Pilots of note included such well-known types as Brian Kingcome, Neville Duke, Titch Havercroft, Don Kingaby, Geoff Wellum, Trevor Wade and many others.